True treasures are sometimes found in totally remote areas, and especially in the case of Panerai watches made for German Kampfschwimmers, the further away from Italy they are found, the higher the chance the usual suspects did not touch them. The following watch – a previously unknown Rolex-made vintage Panerai 3646 with sought-after Kampfschwimmer engravings – is such a rare treasure, and on top of that, it is another important piece of the Panerai puzzle. This amazing piece of history just surfaced at the auction house “Lockdales” in Ipswich. Never heard of it? Me neither. Lockdales auctioneers are specialized in rare coins and other collectibles. While browsing their website, I learned they are located is one of the former officers’ barack blocks near the RAF Martlesham Heath airfield. Sounds exciting? It is, but there is more, much more. The auction will take place on Feb. 20, 2019. Please klick the link below to open the auction website. With case number 260576, the present watch clearly belongs to the Type D group according to Ehlers & Wiegmann’s long-established typology. Type D watches in this particular case number range are usually equipped with anonymous aluminium sandwich dials in combination with a tall bezels. The next picture shows such a watch. In contrast to that, the present watch features a so-called “Painted Brass” dial in combination with a low bezel instead. There is another watch with similar characteristics only 16 case numbers away (260560). 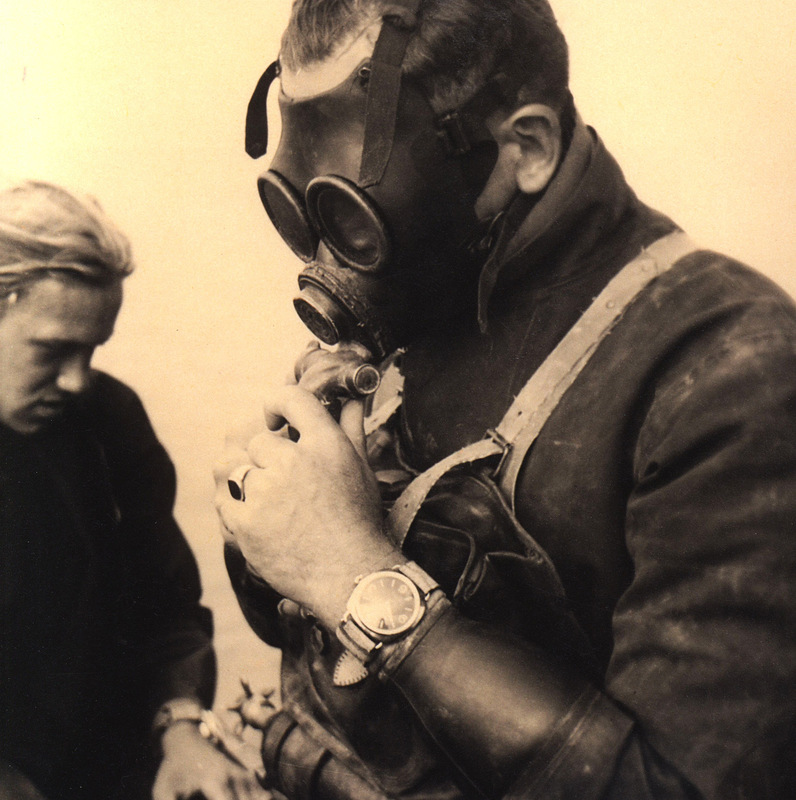 That watch belonged to Karl-Heinz Kiefer, a German Kampfschwimmer who completed his frogman training only weeks before WW2 came to an end. On the train ride to his first mission in the Allied port of Ancona (Italy), Kiefer was injured when Allied bombers attacked his train and as a result, he was never deployed. Kiefer and his comrades were later taken prisoneer by the British on the island of Sylt. Kiefer’s watch became famous thanks to Ehlers & Wiegmann’s many publications and vintage Panerai enthusiasts ended up calling his type of dial “Kiefer” dial. 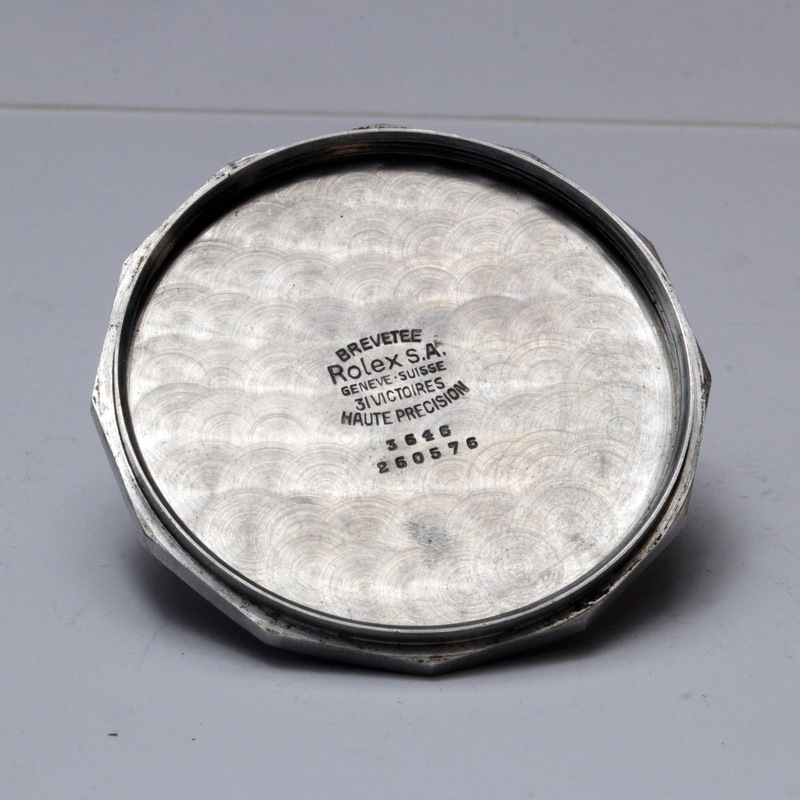 Within Type D, the big chunk of watches featuring “Kiefer” dials are located towards the end of the group, between case number 260698 and 260838. Ehlers & Wiegmann based their typology solely on caseback hallmarks. In their book, watches with same hallmarks automatically belong to the same group, despite their obvious differences. Late Type D watches (260700 – 260838) are not only different, they actually belong to a later batch and here’s why. 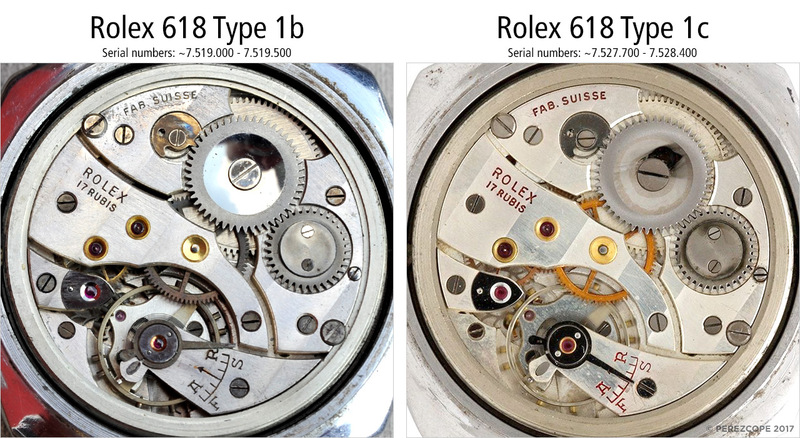 Early Type D watches with anonymous aluminium sandwich dials have movements in the 7,519 million serial range (Rolex 618 Type 1b) while late Type D watches featuring “Kiefer” dials have movements in the 7,528 million serial range (Rolex 618 Type 1c). In addition, the movement bridges of the latter also feature a different kind of plating (probably nickel vs. rhodium). Considering all the above, I bet the movement of the present watch – and also Kiefer’s watch for that matter – is in 7,528 million region. If this is true, there is a simple explanation as to why these watches can be found within the early Type D case numbers. The casebacks were mixed-up when the engravings were applied in 1945. 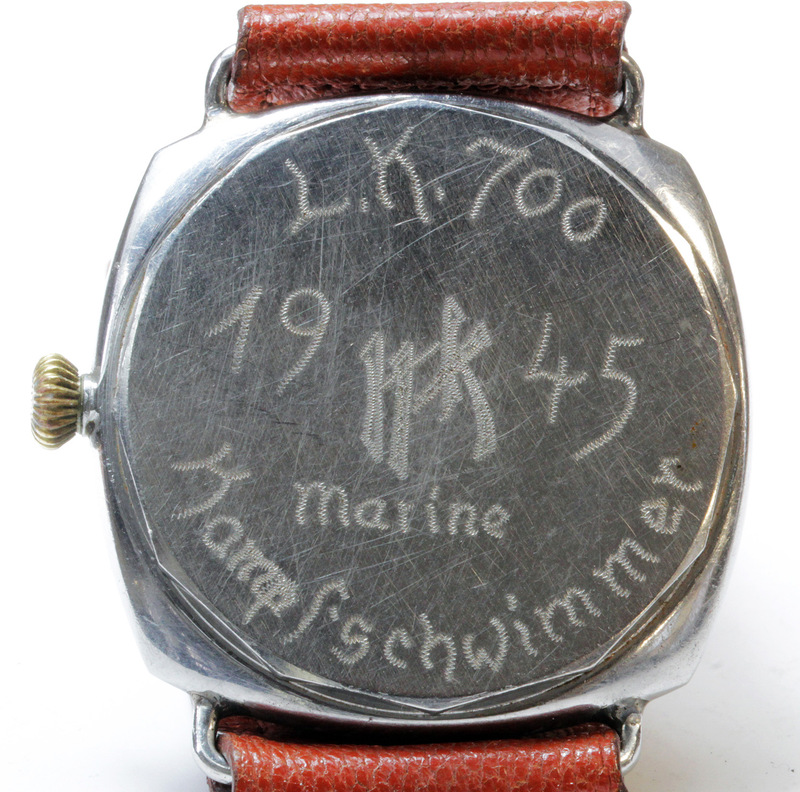 Just like the last Kampfschwimmer that surfaced in Germany in July 2018, the present watch features the same type of completely anonymous “Painted Brass” dial. This type of dial consists of a 1 mm thick brass disc with recessed numerals and markers. The lume is applied in a rather rough way. Some people associate the way the lume was applied with children paintings. “Painted Brass” or “Kiefer” dials are not typical for Panerai. 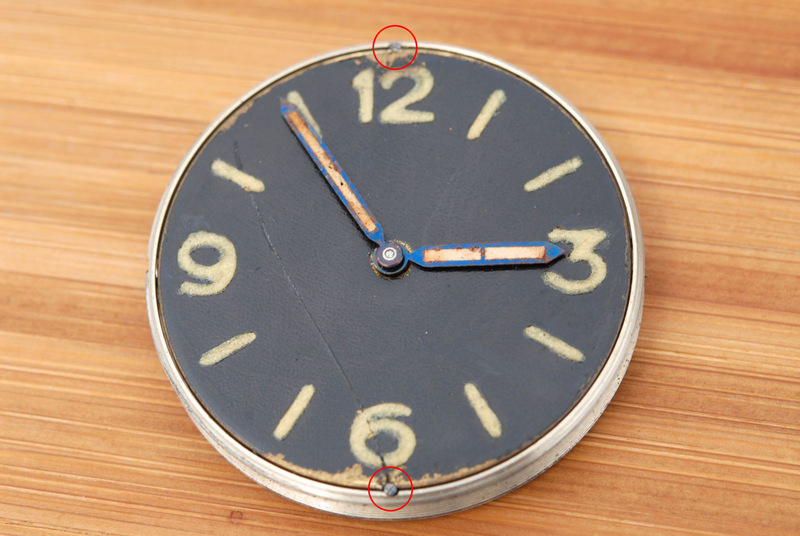 If we look at Panerai dials made prior to this type of dial (1940 – 1944), they all have one thing in common. Whether it is the very first riveted plastic dials or the following aluminium sandwich dials. They are intricate and more importantly, super precise! “Kiefer” dials on the other hand are rather unrefined and rough. Attributes you wouldn’t necessarily associate with a precision workshop like G. Panerai e Figlio. The WW2 (World War 2) timeline holds probably the answer as to where these dials came from. In early August 1944, the British Eighth Army reached Florence. 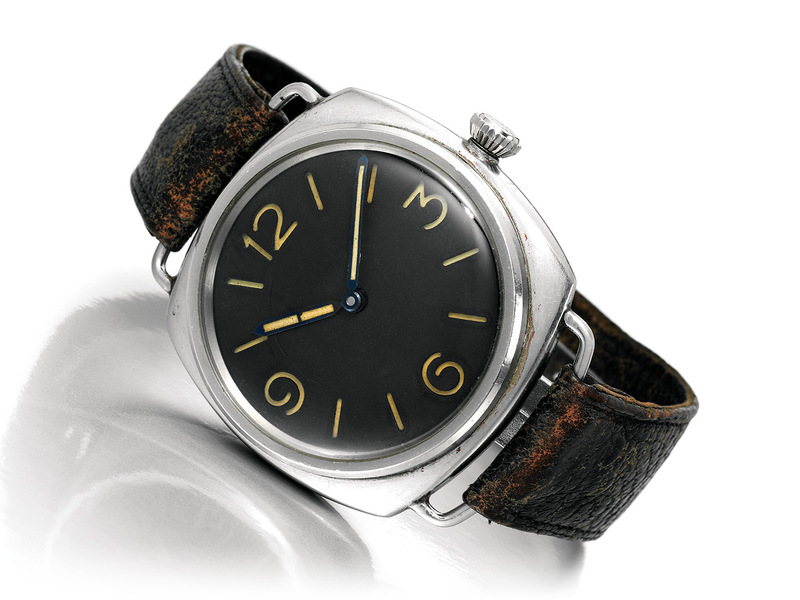 A few weeks earlier, the Nazis raided the Panerai workshop and seized most watches, instruments and even machines. Everything was shipped to Venice to the Arturo Junghans watch factory on the island of La Giudecca. Venice was still under German control behind the heavily fortified “Gothic Defensive Line” and in addition, the Kampfschwimmers had established a secret training camp very close-by on the small island San Giorgio in Alga. 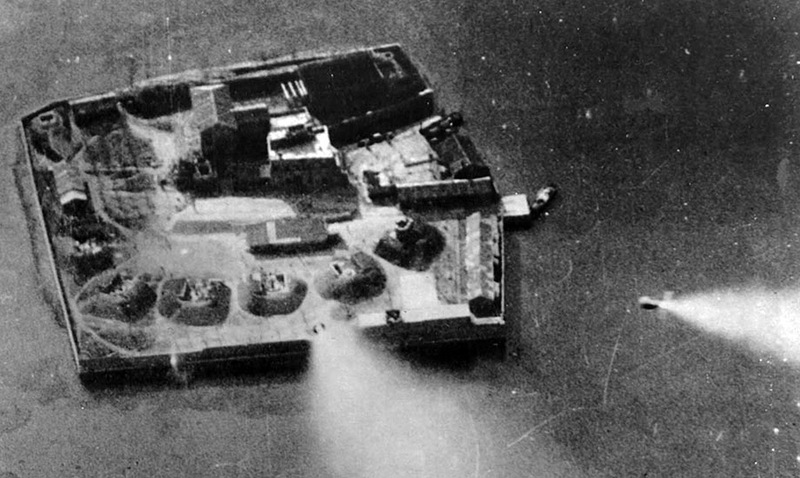 The picture below shows the small island only seconds before being hit by High Velocity Aircraft Rockets (HVAR) during an Allied air strike in early 1945. The Kampfschwimmer Lehrkommando 700 (Einheit Wandel) had left San Giorgio in Alga by Nov. 1944 and established a new frogman traning centre on the island of Sylt in Norther Germany. San Giorgio in Alga had four 76mm anti-aircraft guns and remained in German hand. The final 3646 batch which Rolex sent to G. Panerai e Figlio in summer 1944 featured so-called “California” or “Error-proof” dials. Panerai had run out of aluminium and asked Rolex to deliver future batches with luminous dials. The first “California” dial batch happened to be faulty. 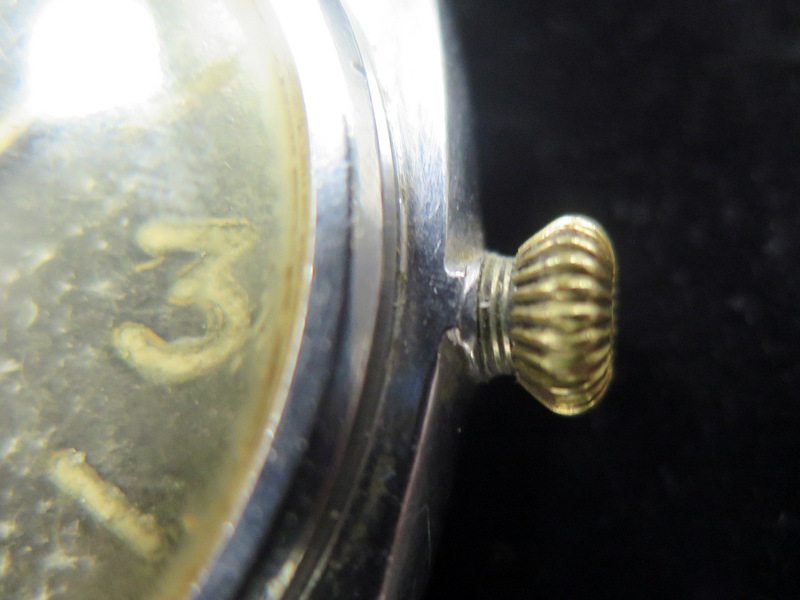 Stern Frères, Rolex’s dial producer, had soldered the dial feet in a pocket watch configuration (crown at 12 o’clock). The following comparison shows a dial from the first faulty “California” dial batch next to a proper dial from the second batch. Can you see the difference? This is how a faulty dial would have looked like when installed. To salvage the faulty dials, Rolex removed the dial feet (check the comparison above) and installed the dials using two tiny screws at 12 and 6 o’clock. 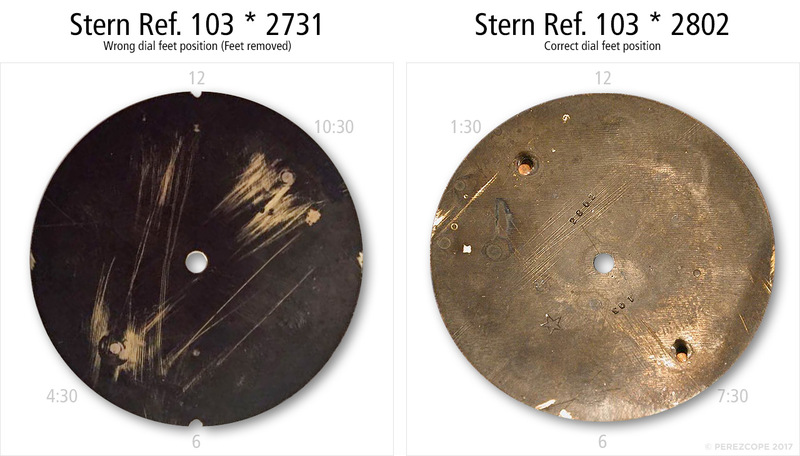 Interestingly, the first “Kiefer” dials were installed using exactly the same method. From a logical point of view, only a company without any experience in this type of watches would have made such an effort. As a matter of fact, Arturo Junghans had no experience with these watches. This observation leads me to believe it was Arturo Junghans who created the “Kiefer” dials. The following picture from late summer 1944 shows the German Kampfschwimmer Friedrich Hummel wearing a 3646 with “Kiefer” dial during a training excercise in the Venetian lagoon. The guy in the back is instructor Alfred von Wurzian. 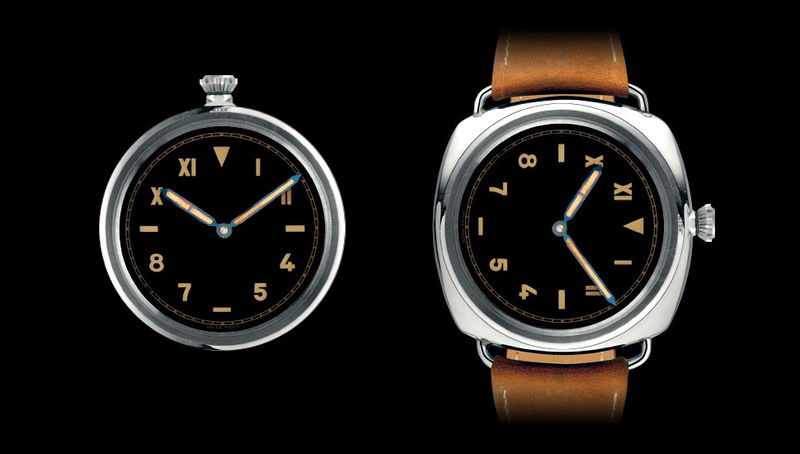 By the way, the modern Panerai owned by Richemont claims “Painted Brass” dials are from 1938. Not sure where they got their information from but the timeline and the overwelming evidence in form of Rolex case numbers, engraved years on casebacks, etc. state differently. The case of the present watch seems to be in a good condition for its age. The soldering of the wire lugs looks intact. The following picture shows the sought-after Kampfschwimmer engravings. “L.K. 700” stands for Lehrkommando 700 (Einheit Wandel), a German frogman training centre established in Italy and later moved to the island of Sylt. “HK” are the initials of the original owner. This type of engravings were made in May 1945 when German Kampfschwimmers were in British captivity on the island of Sylt in Northern Germany. The engravings were applied with a modified razor and were meant to commemorate their comradery and the war. 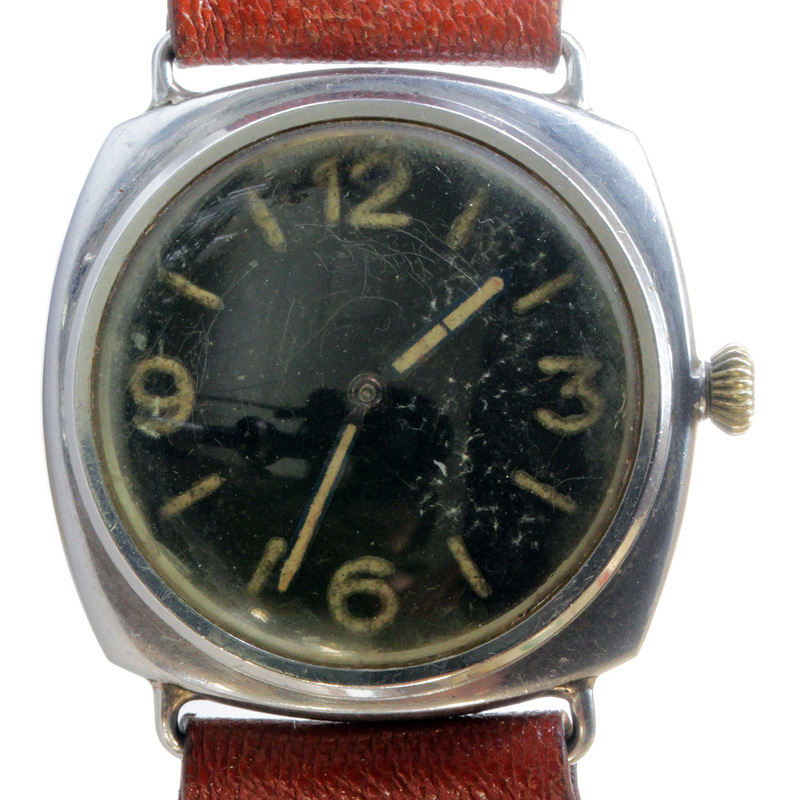 Many of these watches were later confiscated or traded for cigarettes, etc. and ended up in UK. Currently, there are around 30 watches with this type of engravings in my vintage Panerai database. The crown is not original and appears to be a replacement from a pocket watch. As you can see on the following picture, the crown tupe seems be worn out or have been modified to take the current crown. A restoration to original condition will require a new crown tube. Original Rolex “Onion” crowns No. 11 and the corresponding crown tubes can still be sourced. The next picture shows the typical Type D Rolex hallmarks. The inside of the caseback is fully adorned with perlage finish. The next picture shows the engine of this watch, a Rolex 618 with 17 jewels and Breguet overcoil hairspring. A closer look at the engravings and the plating of the bridges reveals that this movement is most certainly a Type 1c (third batch) with a serial number in the 7,528 million range. 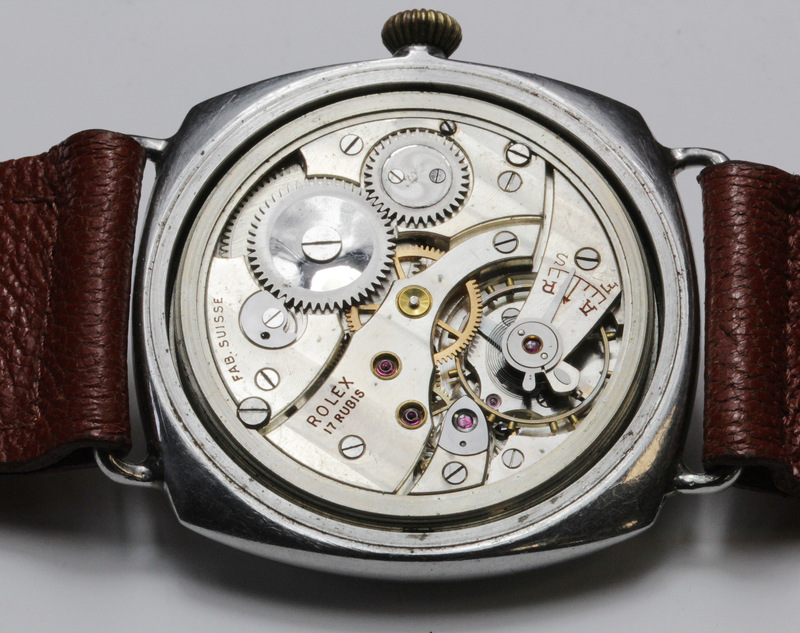 Considering its age of over 70 years, the movement is in a great condition. The movement retaining ring is a perfect match and is at it should be. It is unknown whether the original lead gaskets are part of the set or not. According to auctioneer Lockdales, the present watch features the original leather strap. I very much doubt this is the original strap. According to Kostas Venizelos, the famous strap expert known as Kostas Straps, this strap appears to have been made in the 1960/70s. The buckle is without a doubt original and very sought-after. It is made of nickle-plated brass. The buckle tongue has lost its plating almost completely. The present watch is not only an extraordinary piece of history, it is also an important piece of the Panerai puzzle. When Giuseppe Panerai died in 1972, he took all his knowledge about Panerai watches to his grave. The vaccum he left is slowly filled thanks to pieces like this. Except for the strap, the present watch appears to be in original condition. Unfortunately not much is known about its provenance. I hope the auction house Lockdales will soon get back to me with further information. Recent vintage Panerai sales show an upward trend in prices. If you are interested in this type of watches, keep in mind this could be one of the last opportunities to get an original vintage Panerai watches for a fantastic price. Rolex-made Panerai watches of Ref. 3646 with “Painted Brass” dial are an important milestone in Panerai’s history. These watches were literally shaped by historical events. 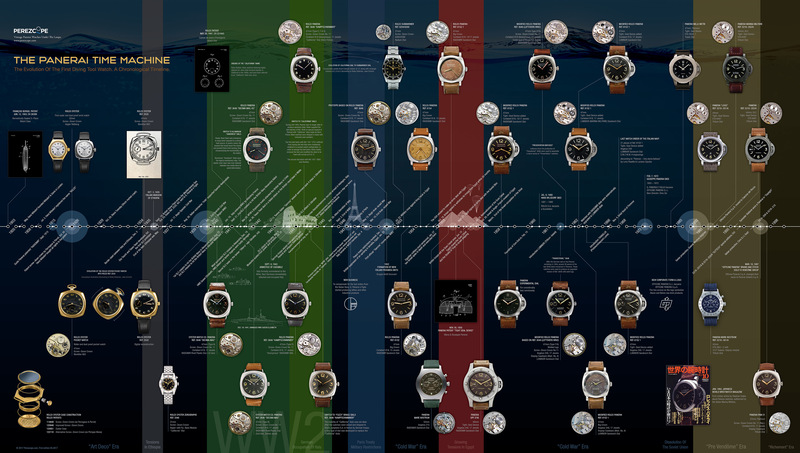 The infographic below shows all vintage Panerai watches in their historical context. Please click the graphic to download the highres version. Wow, what a story on a watch. Your knowledge on these is nothing short of astounding. I cannot thank you enough for your stories on these watches. I am a great fan of your work sir ! 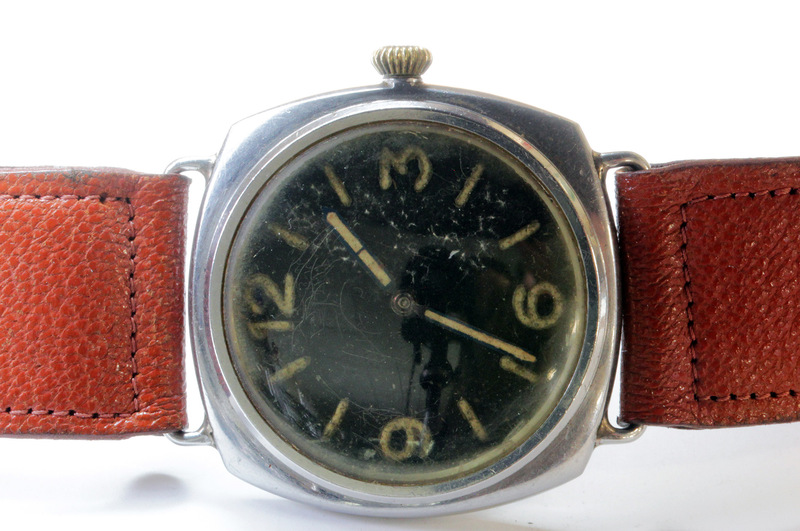 I have a question – this is an anonymous dial, yet the case back maintains Rolex markings . I thought Rolex removed their markings from the cases ? Hi Tony, thank you for your feedback. Type D watches with anonymous dials retained their Rolex hallmarks. The Rolex markings were only removed on later batches (Type E/G). How difficult would it be to replace the crown with a more relevant period crown ?? Marc, the auction house just sent me detail pictures of the crown tube, which are now included in this article. The crown tube seems to be worn out and needs to be replaced as well, if an original crown is to be installed. I jope youre well ! Just checked auction link, watch sold for 30.000 (~45.000euros?) without fees… its a “cheap” price no ?